I waa amazed to see how teenage girls of my college are keenly watching/discussing #PSLT20 matches - its Success - Thank you @TheRealPCB ???? OUT! This is really huge blow for Kings. The former skipper Malik departs for four ball dubk. Karachi trembling at 29-3. Malik gone for duck ???? 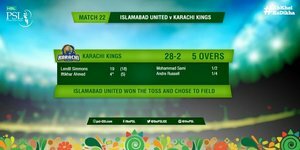 Shoaib Malik poor form continue and out for duck! Karachi kings can only beat Lahore qalandar in playoffs. Oho yeh kya hua @realshoaibmalik duck ???????????? Karkardagi mutassir hogai #PSLT20 !!! شعیب ملک , بوپارہ کو پیور پاکستانی خصلت دکھا گیا ھے ???? Shoaib Malik is out for 0, c Haddin b M Irfan. Haha Without Captaincy Even Your Performance Is Zero.??? ?